Unveiled during Spaceworld 2000, the Nintendo GameCube was widely anticipated by many who were shocked by Nintendo's decision to design the Nintendo 64 as a cartridge-based system. 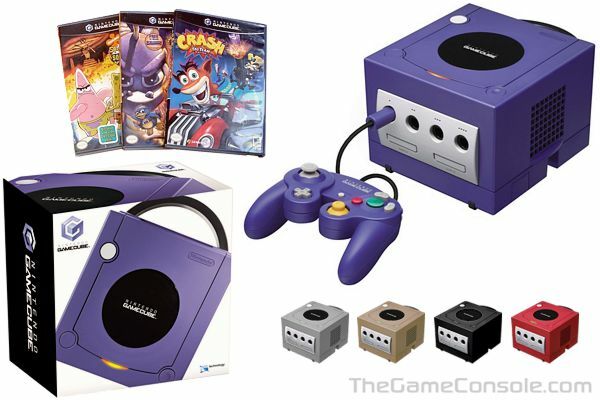 Physically shaped similar to a geometric cube, the outside casing of the Nintendo GameCube comes in a variety of colors, such as indigo, platinum, and black (also a limited edition Resident Evil 4 platinum and black game console). The Nintendo GameCube uses a unique storage medium, the GameCube Optical Disc, a proprietary format based on Matsushita's optical-disc technology; the discs are approximately 8 centimeters (3 1/8 inches) in diameter (considerably smaller than the 12cm CDs or DVDs used in competitors' consoles), and the discs have a capacity of approximately 1.5 gigabytes. The disc is also read from the outer-most edge going inward, the opposite of a standard DVD. This move was mainly intended to prevent piracy of GCN titles, but like most anti-piracy technology, it was eventually cracked.